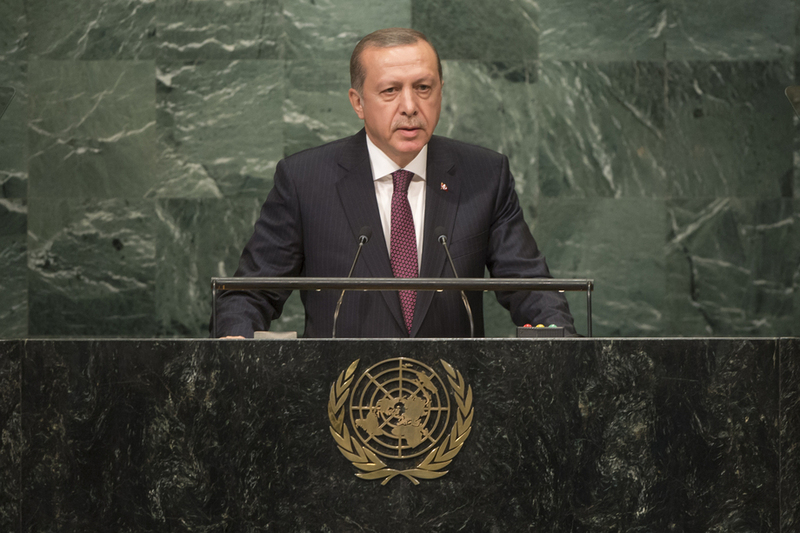 RECEP TAYYIP ERDOĞAN, President of Turkey, said that in the first quarter of the twenty-first century, humankind had reached the peak of its achievements in science, economic development and health. However, that picture also had “a disgraceful and dark face”. Syria, Iraq and many other countries were marred by war and terrorism that had killed hundreds of thousands of women and children, young and elderly. Those fleeing that “death and tyranny”, he said, “face degrading acts in European cities”. What was more even distressing was that many of those crises could easily have been resolved, he said. Regarding the domestic situation in Turkey, he said the country had been exposed to a “malicious coup attempt” initiated by Fethullah Gülen. Although the attempt had been successfully prevented, the initial intention had been to destabilize countries far beyond Turkey’s borders. Turning to the humanitarian crisis in Syria, he said that his country was hosting nearly 3 million Syrians and had received only limited assistance of $512 million from the international community, including the United Nations. “I observe that the international community has simply been listening to the number of refugees fleeing indifferently and unresponsively for a long time,” he said. While it seemed as though the rest of the world would not assume its responsibilities, Turkey would. His country was obliged to keep its doors open and continue to keep them open in the future. He called upon the international community, and “all European friends” who perceived Syrian refugees as a threat, to “look for peace behind the barbed wire and high walls”. Regarding the situation in neighbouring Iraq, he stressed that the operation to recapture Mosul should be conducted with due consideration for the sensitivities of the region’s people in order to prevent the outbreak of a new humanitarian crisis that would result in more forced displacement. Furthering his critique of the Security Council, he underlined that “the world is bigger than five”, and that the Council did not represent the diversity of its members. He suggested an expansion of the membership, the only way to establish full fairness. In exercise of the right of reply, the representative of Turkey expressed dismay over certain contents of the Syrian regime’s statement, which had contained baseless accusations at Turkey. She was confident that those responsible for the destruction of Syria would be held responsible for their crimes. Until then, her country would stand behind the democratic aspirations of the Syrian people.